A recent study by Joey Mayorquin and team shows a promising chemical response in sycamore trees infected with Fusarium Dieback. This holds hope for the pest/disease complex in avocado, as well. Fusarium dieback (FD) is a new vascular disease of hardwood trees caused by Fusariumspp. and other associated fungal species which are vectored by two recently introduced and highly invasive species of ambrosia beetle (Euwallacea spp. nr. fornicatus). One of these ambrosia beetles is known as the polyphagous shot hole borer (PSHB) and the other as the Kuroshio shot hole borer (KSHB). Together with the fungi that they vector, this pest–disease complex is known as the shot hole borer–Fusarium dieback (SHB-FD) complex. 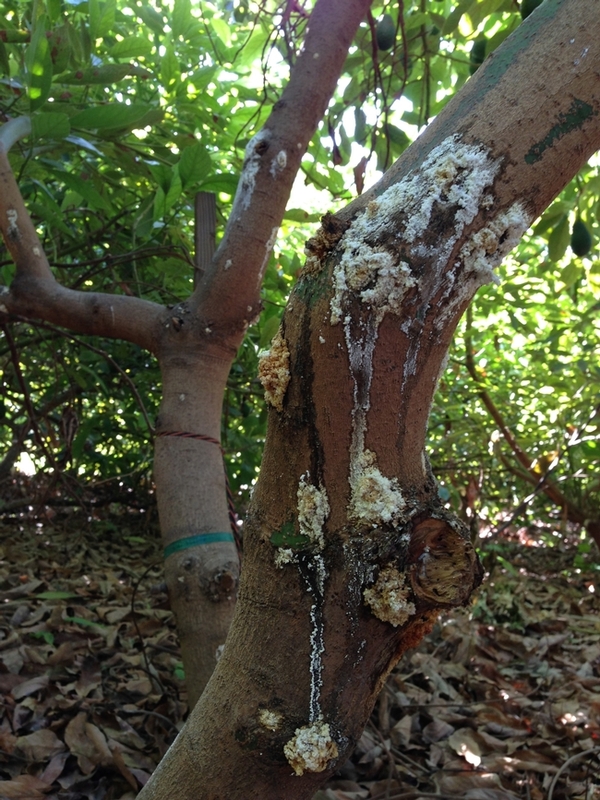 Mitigation of this pest–disease complex currently relies on tree removal; however, this practice is expensive and impractical given the wide host range and rapid advancement of the beetles throughout hardwoods in southern California. This study reports on the assessment of various pesticides for use in the management of SHB-FD. In vitro screening of 13 fungicides revealed that pyraclostrobin, trifloxystrobin, and azoxystrobin generally have lower effective concentration that reduces 50% of mycelial growth (EC50) values across all fungal symbionts of PSHB and KSHB; metconazole was found to have lower EC50 values for Fusarium spp. and Paracremonium pembeum. Triadimefon and fluxapyroxad were not capable of inhibiting any fungal symbiont at the concentrations tested. A 1-year field study showed that two insecticides, emamectin benzoate alone and in combination with propiconazole, and bifenthrin, could significantly reduce SHB attacks. Two injected fungicides (tebuconazole and a combination of carbendazim and debacarb) and one spray fungicide (metconazole) could also significantly reduce SHB attacks. Bioassays designed to assess fungicide retention 1 year postapplication revealed that six of the seven fungicides exhibited some level of inhibition in vitro and all thiabendazole-treated trees sampled exhibiting inhibition. This study has identified several pesticides which can be implemented as part of an integrated pest management strategy to reduce SHB infestation in low to moderately infested landscape California sycamore trees and potentially other landscape trees currently affected by SHB-FD.